, a cloud-based sales engagement platform that allows B2B sales teams to track customer touchpoints in real-time. Founded in 2011, LiveHive enables sales teams to share materials with their customers and monitor how customers interact with these materials. Our service is cloud-based, which means sales teams who are often on the road can easily track their customers’ activities in real-time, and on the go. From the beginning of the company, LiveHive wanted to outsource infrastructure management in a cost effective manner. We chose Google App Engine and Google Cloud SQL because we wanted to focus our efforts on the product functionality that our customers wanted and not spend time dealing with infrastructure issues, including system maintenance, reliability, scalability and database administration. LiveHive stores sales analytics, our customer-facing functionality and product usage metrics for internal business planning in Cloud SQL, which we’ve been using for the past six months. Our customer-facing sales analytics, viewed through interactive charts, graphs and maps online and via mobile device, are all driven by data in Cloud SQL. Cloud SQL updates sales analytics and usage metrics continuously so customers and internal teams always have access to the latest information. We conduct trend and cohort analysis on the internal product usage metrics. This analysis identifies what features are most popular, which helps our sales and marketing teams understand what current and potential customers want in our product. LiveHive sales analytics tell our customers which sales materials their prospects find useful and then ranks prospect interest with our opportunity scoring system. From a database perspective, Cloud SQL met our two key requirements: full functionality of a relational database and easy integration with our cloud platform application. Our initial setup with Cloud SQL was fast and seamless. Now, we have multiple database instances running with access to databases from any of our App Engine applications, which we’ve been using since 2011. 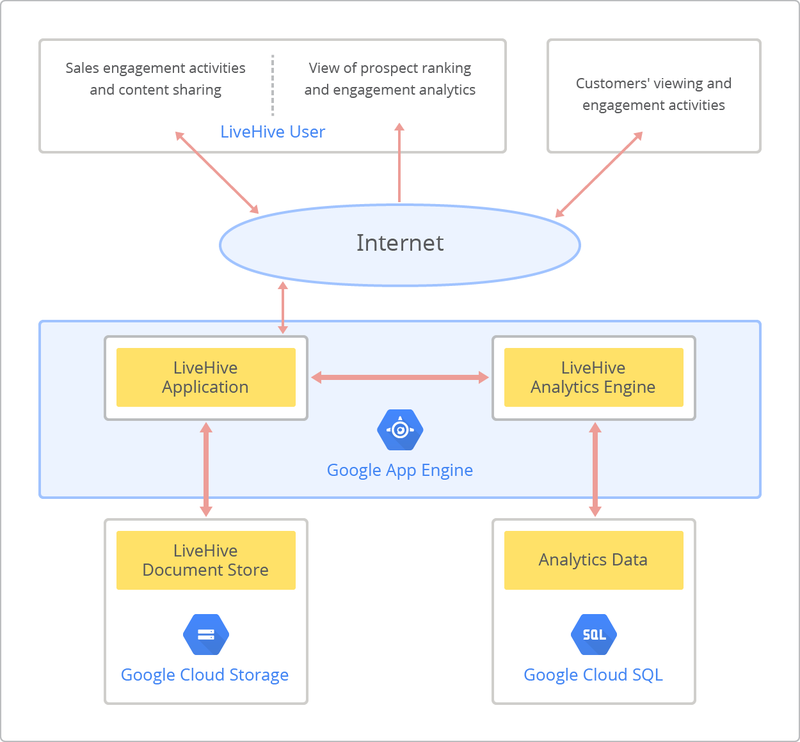 The LiveHive sales engagement platform runs on App Engine and is accessed by customers through our web based user interface or mobile applications. This flexible access between App Engine and Cloud SQL allows us to maintain a test database that can be accessed from multiple development versions of the LiveHive application as well as a completely separate production environment. In both environments, our costs scale with usage, which is a big plus for us since we only pay for what we use. We have already achieved one of our goals: to spend no time managing performance, reliability, administration or maintenance issues! Cloud SQL has more than met our expectations of a cloud-based relational database, and we continue to derive value from it. Today’s guest post comes from Fritz Mueller, vice president of products at LiveHive, a cloud-based sales engagement platform that allows B2B sales teams to track customer touchpoints in real-time.